It’s long been known that poor customer service creates enemies and destroys goodwill. Experts say those who have good customer experiences with a business gain that customer’s repeat business. But if the customer has a bad experience, they tell an average of 10 other people about it, who in turn relay that experience to five others. That was recently borne out when a friend of mine recently traveled on US Airways to attend a relative’s funeral. Her flight on US Airways was so traumatic that she has become a vocal opponent of the airline. First, her flight was delayed for hours as she sat in her plane on the tarmac. This was likely to make it impossible for her or any of her fellow passengers to make connecting flights, and when she landed, sure enough, she missed her flight. But instead of promptly correcting the problem with apologies, she was told there was "nothing they could do" and because of the time of day, no other flights were available. Nearly hysterical with anger, she was forced to stay in an expensive hotel overnight rather than sleep in a big city airport terminal. The following day, she came home, having missed the funeral. Had this been the end of it, it would be bad enough, but after initially promising to refund the $600 ticket price, airline officials later informed her - by email - that she would not receive a refund, because delays were partly due to "weather problems." Infuriated, she has literally told everyone she knows (including me) about this incident, and has urged everyone she knows to not fly US Airways in the future. In fact, she has even told strangers about the situation, going over every excruciating detail with them. And she’s found much sympathy. Imagine how bad this is for US Airways if everyone on the flight has done this. In fact, they may well be doing just that. Research firm TARP recently conducted a study showing that for every 26 unhappy customers, only one will lodge a formal complaint with a company’s management. Remembering that dissatisfied customers tell, on average, 10 people, and they in turn tell five others, the magnitude of poor service begins to seem almost catastrophic. 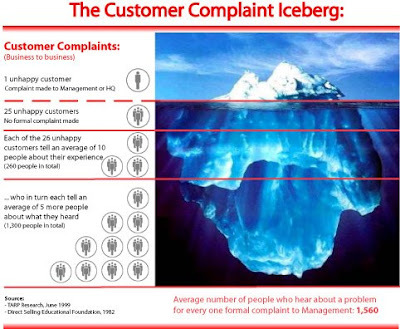 In what TARP calls the "Customer Complaint Iceberg," an average of 1,560 people will hear about at least one of these unhappy customers' experiences. Now, when you think about the 25 unhappy customers who DIDN’T complain, but still might spread negativity about you poor service, it becomes a near-nightmare scenario for a company. Reputations are built on goodwill, and goodwill is built with good customer service. Business owners need to be pro-active about customer satisfaction. They need to actively survey their customers to quickly identify any flaws in their delivery of goods or services, and to quickly correct those problems. Abbott Public Relations can conduct a Customer Service Audit that will survey your customers and help identify possible problems - before they start complaining to their friends, family and strangers. Don’t wait for disaster to strike, in the form of an army of angry former customers. This is the first official day of Abbott Media, a company designed to bring news and information to its intended audiences in creative, innovative ways that fully engage the consumer. Abbott Media is about innovation, information, and inspiration. Like other microbusinesses, Abbott Media seeks to embrace new ways of doing business, so we can survive and thrive in the new information marketplace of ideas. Abbott Media seeks to bring news and information to its intended audiences in creative, innovative ways that fully engage the consumer. Abbott Media seeks to inspire other micropreneurs - It is about empowering microbusinesses and the micropreneurs who run them to embrace innovation in both the new and old media. We will grow our business by helping other microbusinesses - we seek to inspire and engage our customers, so they, and we, will be able to more quickly grow their businesses from their home office to a downtown office. Micropreneurs need and deserve support. Abbott Media brings that support, and will bring together other micropreneurs to share their travails and successes. As we look back boldly on this journey we're embarking on today and say, "we've been there," we will be willing to show others the way there, too. On Tuesday, Feb. 26, 2008, every Starbucks restaurant in the world closed down for three hours. The dramatic move was made by Chairman and CEO Howard Schultz, who recently came back to the company after a few years’ absence. The reason for the shutdown? To get back to the company’s roots: re-educating 135,000 employees in its 7,100 locations in the "art of espresso." Service at the well-known retailer has, many customers said, been lacking. Not helping was the clerks’ new task of making breakfast sandwiches, which some observers say took them away from their core business. The sandwiches have been cut, and Schultz no doubt drove home the point that service must be Goal Number One at the company during the three-hour shutdown. But from a PR point of view, this will be seen as a great move only if it actually results in better service. Otherwise, it will be seen as a stunt, and no one will be fooled. Perceptions will be changed only if the shutdown and retraining result in positive changes that people notice. It’s not "PR" to hold a retraining session and make it public. It’s whitewashing, and no one will be fooled. But if this was a sincere effort to change poor service and a fuzzy mission that actually results in change and a clearer mission for the company, then it indeed will be. I always advice clients never to lie about change, or about the need for them to change. Customers will see right through it, and any value they may have accrued from acknowledging that need to change - and taking those positive steps - will be lost if it’s seen as mere whitewash. Real change means taking real steps, and PR cannot be used to simply say changes were made when they were not. Your customers and clients are too smart for that.